Sonia Cillari, Italian media artist, winner of VIDA 13.0: Art & Artificial Life International Competition (Madrid, 2010) and honorary mentioned artist (Interactive Art) by Prix Ars Electronica in Linz (2011), just left Moscow. She ran the EMOTIONAL SKIN workshop there as a part of the “Polytech.Science.Art” program of the Polytechnic Museum. The entire title of the five-day workshop was “Emotional Skin. 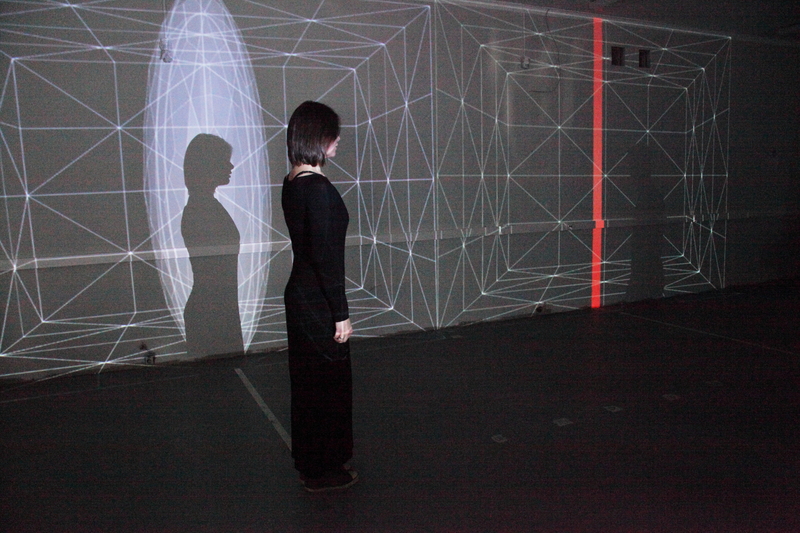 Performance Space Expression” with the subtitle “Sensing Spatial Experiences”. Participants created a new performance, the realization of which investigated both the fields of research of ‘Body as Interface’ and ‘Performative Spaces’. 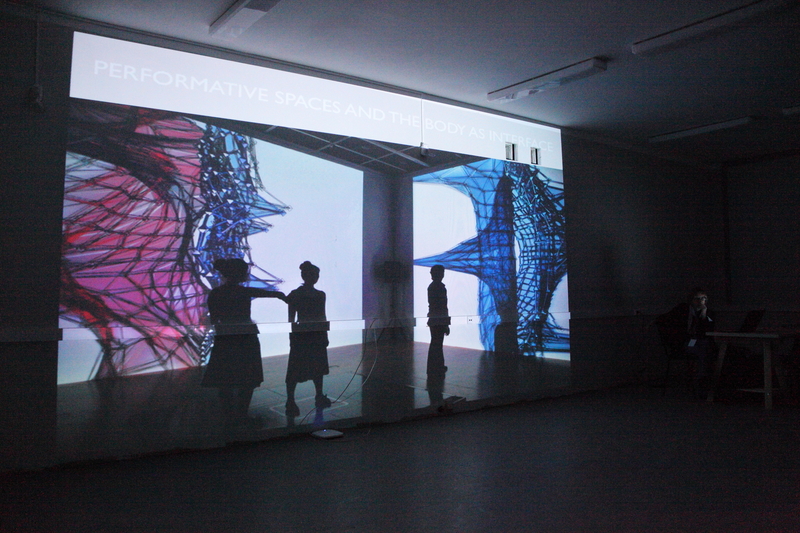 The performance focuses both on the visualization and sonification of the changes of the proximity of bodies in physical space, as well as on the relations between body and space, which are revealed by the performative connections between the bodies and their related visual and audio environments. 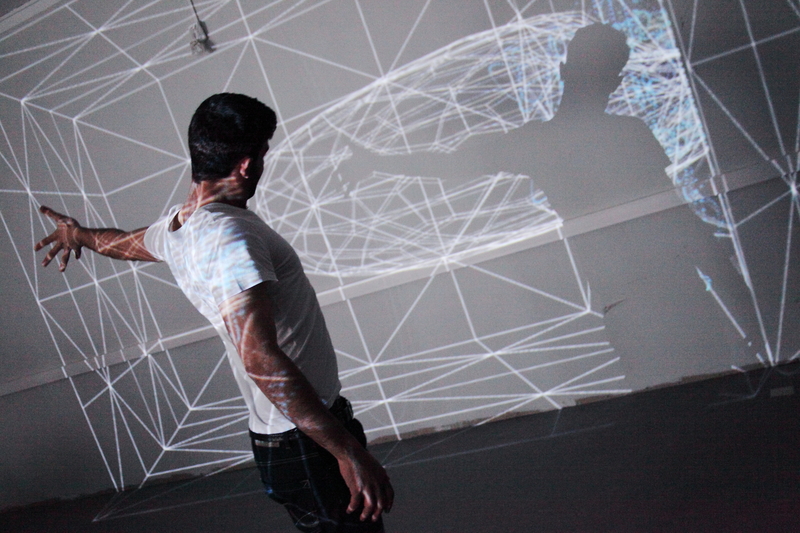 With an homage to Oskar Schlemmer’s famous drawing – Figure in space with plane geometry and spatial delineations (ca. 1921) – the performance adopted a minimalist grammar marked by essential geometrical digital structures and was shaped as a perceptual organism, which reveals the invisible force fields between those entities – physical bodies and their own environment. The premiere of the performance – which was named “Behaviours” in the end – will take place on June 12, 2014 at the 3rd International Festival of Media Performances in Moscow. 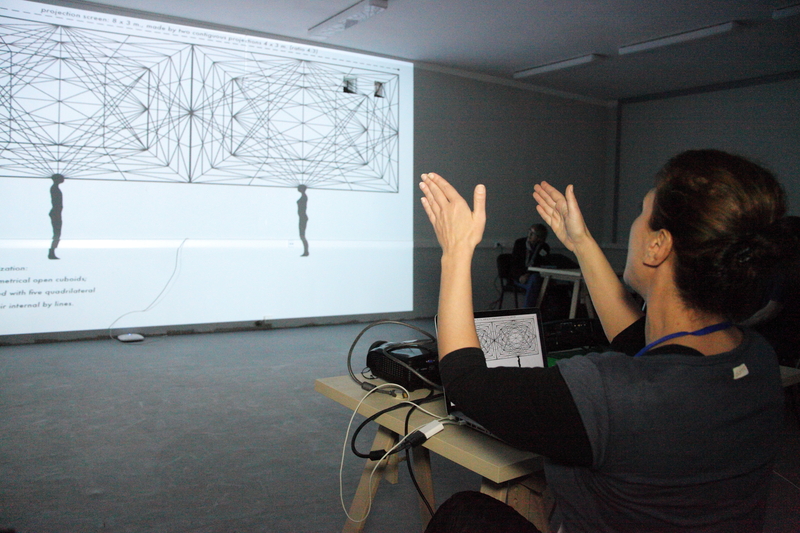 Natalia Fuchs: How did it happen that “Body as Interface” became the main subject for your artistic explorations? Sonia Cillari: I would like to start answering this question by quoting the French philosopher Merleau-Ponty. In his “Phénoménologie de la perception” he states: “Our own body is in the world as the heart is in the organism: it keeps the visible spectacle constantly alive, it breathes life into it and sustains it inwardly, and with it forms a system.” I don’t have a body. I am a body. A body that is a vehicle of communication. We can’t speak about the body without speaking about space: Space is body-centered; the body is in the center. Behind their mechanistic appearance, there are not absolute space and time, independent from us. I have always been fascinated by the physical space that surrounds us. This ‘non-void’ is a dynamic quantity of superior importance. It is the place where the most complex fluctuations of energy are happening. Our bodies are in constant interaction with such environments; they inform and redefine each other into one single continuous existential experience. Human beings experience physical reality by means of their sensory system. Sensorial inputs enable our consciousness to map the world around us. As the process of ‘becoming aware’ becomes true by the acquisition of information through sensations, our modes of perception ‘must’ be stretched to physical reality in a deeper way. It is important to enrich our perception with a different spatial sensibility because our perception doesn’t identify the external world as it really is – organic, fluid, the center of probabilistic waves – rather only in the way we are ‘allowed’ to recognize it. NF: How do you propose to enrich it? SC: To create higher levels of dynamic physical interactions with our environment, new spatial behaviors and stimuli need to emerge; we need to apply multi-sensory immersivity to expand our experience of spatial sensibility and actuate the evolutionary ‘refinement’ of perception. Contemporary art tends to neglect ‘human’ qualities in terms of possibilities for enhanced spatial experiences. “The observer becomes detached from an incarnate relation with the environment through the suppression of the other senses, in particular by means of technological extensions of the eye” (Juhani Pallasmaa, The Eyes of the Skin, 2005). NF: You create your performances not alone but within an interdisciplinary group. Who’s your team, who are your collaborators? SC: My works are founded on a balance of elements of different nature. My ideas are born out already complete, and, in general, the process starts with the identification of the aspect to be investigated and the subsequent choice of a strategy to do that. Afterwards, by means of the preparation of a methodology, the innovative aspects requiring a wider experimentation can be defined. The performative aspect is then fundamental in the last part of the process because, in order to experiment such aspects accurately, all the integral parts of the work are necessary. In the first phase of the process I choose a team of specialized collaborators, depending on the parts to be investigated and/or realized. My collaborators enter a pretty defined methodology of work, varying on the base of the results to be integrated. Our relation has a constant feedback. For my latest works I have been working with a quite fixed team of professionals, who are based in Amsterdam and Berlin: pix and Ulrich Berthold for the environment programming, Kees Reedijk and Stock for the hardware development, Tez for the sound design. NF: What do you think of cross-disciplinarity in arts? SC: To investigate sensorial and perceptual mechanisms in immersive environments it is necessary to work within a range of creative and scientific disciplines. Theoretical and practical connections between different areas and disciplines, in fact, reveal new ways for exploring methods of investigation, which relate to the crossovers between those fields of art and science. These methods enhance and strengthen both the creative process and practice. NF: How does your background as an architect influence your artworks? How are you connected to scientific research? SC: As an architect, since the beginning I chose the field of art and science to investigate the way human beings can actually ‘make an experience’ of space and how we, as perceivers, reconstruct the internal and external worlds by means of our sensorial system. My work aims to emphasize both the physical and the metaphorical ways in which human beings relate with each other and with their environment. Over the years my work has fused all these fundamentals into the creation of sensorial and perceptual mechanisms, immersive spatial works that are at the intersection of architecture and performance art; they are what I refer to as ‘performative spaces’ – the creation of physical spaces, perceptible to the senses, each segment of which contains potential realities, some revealing natural phenomena, some not. My artistic investigation examines how patterns of consciousness, perception, and identity emerge in such settings. I use participation as a continuous mutation of the initial spatial conditions, to reinforce the ‘external-to-you’ as continuously variable. Scientific research has always been the basis for investigating and acquiring new knowledge. The study of physics and issues such as the nature of space and time help me to investigate how to reveal the aspects that are constituents of physical reality, and at the same time how to reveal the physiological functioning of the body as a complex organism. Over the last years, specifically interested in the field of research related to the ‘Body as Interface’, I have been investigating ‘bioelectricity’ and ‘biomagnetism’. My concern was to show that the boundaries of the self extend beyond our skin. Specifically, I was interested in what ‘skin consciousness’ is and in how presence, proximity, and touch can redirect the way we understand ourselves and others, exploring experiences of bodily expansion. The challenging task of creating immersive environments needs the artistic pursuit of sensuality coupled with scientific concepts. NF: You have spent quite a lot time at different residencies. What is the most important thing for an artist experiencing his of her artist-in-residency period? SC: I think, for an artist, the experience of a residency period can be one of the most valuable times for his or her career. Beside the opportunity to share a period of creative working with other artists, the possibility to realize new artworks – with the help of facilities and professionals – is to be taken highly in consideration. I have been lucky to participate in different AIR programs, and especially to be invited by the Rijsakademie van beeldende kunsten in Amsterdam, which has been a springboard for a number of artists, as well as by the Netherlands Media Art Institute and Steim – also in Amsterdam – institutions which I respect very much for their efforts in investigating and disseminating electronic art. NF: Which artists/artworks have impressed you recently? Tags: Artificial Life International, contemporary art, environment, Interactive Art, Juhani Pallasmaa, Moscow, Natalia Fuchs, Performance, Phénoménologie de la perception, Polytechnic Museum, Prix Ars Electronica in Linz, Sonia Cillari. Bookmark the permalink.